SA-01 Site Alarm is suitable for connection up to 20 units. Formed with simplicity and reliability in mind, this product is designed to be lightweight, yet sturdy enough to withstand the element. Upon activation, sounder beacon goes off to alert others of emergency. The loud sound and bright beacon make it noticeable from far away. 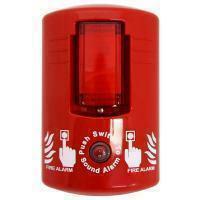 Battery-operated unit makes it easy to set up this fire alarm anywhere at the site. The site alarm checks itself periodically for battery consumption and will flash to warn site occupants of low battery. 2-wire connection up to 20 units, forming a linkage alarm system. Suitable for large construction, campgrounds, temporary accommodation, marquees, indoor and outdoor area. Tone: Bell, sweep, siren, whistle, etc.